Surya is in jail. Out of nowhere, he gets released. He comes out and asks a sidekick nothing but "why?" Comes an equally curt reply "Deva". The above scene defines a man who transformed Tamil cinema. 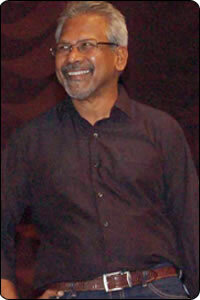 Mani Ratnam has been a big influence in every young cinema-goer's life. Crisp dialogues, top-notch camera work, brilliant music, remarkably scripted screenplay-quite easily, he was the third best thing to happen to Tamil cinema after Sridhar and Bharathiraja. 1. The most interesting feature of his movies has been the usage of visuals rather than dialogues to move the plot. A classic example is the scene in "Bombay" where Manisha Koirala gets a letter from Aravindsamy with two train tickets. Other directors would have opted for a voiceover to explain the letter. Mani sensibly leaves it to the audience. He shows the letter with tickets and Manisha is on the way to Bombay in the next shot. 2. Subtle interposition of sensitive issues like Hindu-Muslim conflict, Kashmir terrorism and Srilankan ethnic conflict with intensely personal matters like passionate love, wife searching for her husband and a child longing for her mother is something only Mani can pull off. 3. Biopic is another largely untouched genre explored to perfection by Mani. Be it Varadharaja Mudhaliar or Dhirubhai Ambani, it has been a passionate portrayal onscreen. To compress an entire lifetime into less than 160 minutes is not a cakewalk. 6. The screenplays of his are so intense and engaging. The storyline of "Thalapathi" is so simple that had Perarasu handled it, it would not have been released at all. While Selvaraghavan takes an entire movie to establish the metamorphosis of a gangster in "Pudhupettai", Maniratnam takes less than 5 scenes in "Ayudha Ezhuthu" to do the same. "Agni Nakshathiram" still remains the ultimate definition of a "gethu" movie to any youngster in the 80s.Karthik's episode in "Mouna Raagam" remains the breeziest flashback in a Tamil movie. 7. Some of his movies have been message oriented as well. While "Bombay" cries for an end to the Hindu-Muslim conflict, "Ayudha Ezhuthu" was a catcall for youngsters to join politics. While all love flicks ends in a marriage and subham, "Alaipayuthe" beautifully explores the post-marital tensions. While "Nayagan" gives the dangerous message of "If it benefits some, even a murder is justified", Guru extols a not-so-righteous but ambitious man. 8. Mani is one person who has never worried about commercial success. Since all movies are from his own production houses, there is no chance of a Baba-like guilt. Mani is an enviable person who takes movies which he likes. No one else alive in Tamil cinema can fit in that statement. As "Raavan" gears up for release, (The usual Mani-styled marketing: No talk of the movie till post-production works is complete, frenzied marketing on the eve of release) the usual fever rises. The storyline is quite predictable from the trailers but the expectations do not sag at all because of Brand Mani. Personally, I am not that optimistic about "Raavan" but I am sure that I will see it five times at least. Mani is one of his kind! VIJAY FANS CONDEMN THEATER OWNERS & THE MEDIA!